Despite the title, “The Man Who Knew Infinity” is not a science fiction yarn…although its real-life hero was probably regarded by his contemporaries as an extraterrestrial or a visitor from the future. Srinivasa Ramanujan (1887-1920) is, nearly a century after his death, still regarded as one of the most important mathematicians of all time. He appears to have been a natural — he never received any formal training. Writer/director Matt Brown’s biopic follows Ramanujan (Dev Patel) from an impoverished childhood and early marriage in India to the heights of mathematical study at Trinity College, Cambridge. The bulk of the film takes place in pre-World War I England where the young savant becomes a protege of math great G.H. Hardy — although after a few weeks one could ask who exactly is teaching whom. Granted, few moviegoers regard math as a scintillating subject for dramatic exploration. Indeed, while “The Man Who Knew Infinity” (the title refers to Ramanujan’s ability to visualize numbers so large they put the rest of us into meltdown) cannot escape talk about primes, theta functions, divergent series and whatnot, the film’s dramatic core rests on more recognizable issues. Like racism. For all his genius, Ramanujan was regarded by many on the Cambridge faculty as a mere “wog.” The prevailing view was that as such he must have stolen his results from brighter (i.e., whiter) minds. Even Hardy begins their relationship with a rather patronizing attitude. At times the Indian guest faces physical violence. Not to mention the isolation of being one of the few Indians on campus. A strict vegetarian, Ramanujan discovered to his dismay that in England even vegetables are cooked in lard; the combination of a poor diet and a miserable English winter probably contributed to his early death. Ideally, a sequel gets made because there’s more to explore in the story or characters. Most often, though, the sole motive is money. 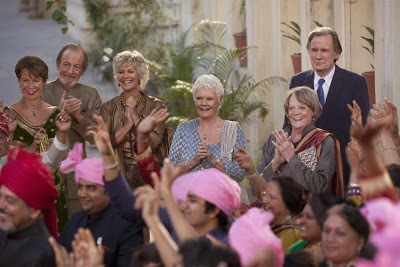 The first film was a sleeper hit, thanks to its stellar British cast (Maggie Smith, Bill Nighy, Judi Dench), the exotic Indian setting and its amusing blend of expatriate adventure and cheeky septuagenarian sexuality. It never added up to much, but it went down easily, especially with the gray-haired crowd that rarely gets to see itself portrayed with any sort of dignity on the big screen. But though this follow-up was made by the same people — director John Madden, screenwriter Ol Parker and the returning players — all the charm seems to have evaporated. It’s a paint-by-numbers effort. The screenplay gives each of the retiree residents of the Marigold Hotel [added:] in Jaipur a crisis to overcome — usually a romantic one. Contrasting against those late-life liaisons are the impending nuptials of young hotel operator Sonny Kapoor (Dev Patel) and his beloved Sunaina (Tina Desai). Fortune hunter Madge (Celia Imrie) has two well-heeled Indian gentlemen on tap but can’t decide which one to marry. Nighy’s Douglas is smitten with Dench’s Evelyn, but he’s too shy to jump and she won’t commit. Bon vivant Norman (Ronald Pickup) fears that he has inadvertently put out a mob hit on his girlfriend, Carol (Diana Hardcastle). Muriel (Maggie Smith) grumpily lectures Americans on how to make tea and quietly nurses her concerns when a medical checkup doesn’t go as planned. These subplots circle a larger story.